I collect Tiki ephemera of all sorts, but I really only actively collect a few things, and mainly only Mai-Kai stuff. 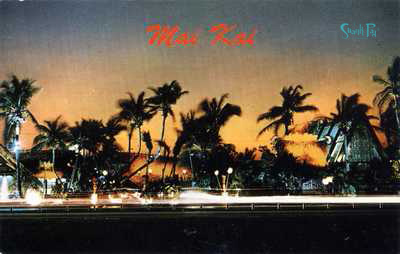 Below are most of the postcards from the Mai-Kai. There are always new things popping up, but I think this is a pretty complete list. A new one just discovered. 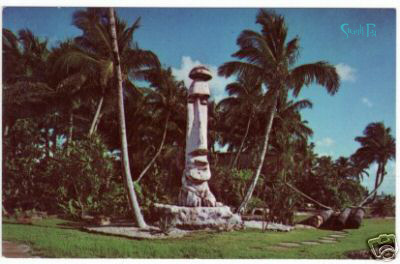 The classic Barney West Tiki still stands as seen in this vintage postcard, although the road has gotten a LOT closer to him! 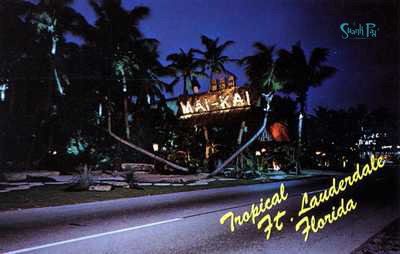 Early card showing the cannibal trio of tikis on the sign. Perhaps the earliest photo card. The covering for the valet area is not there yet. Look how few trees are around. It really was out in the middle of nowhere. A slightly later image, now showing the covered valet area. 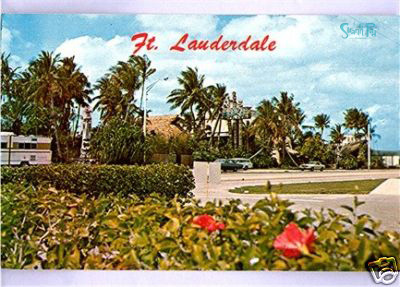 These two are some of the most common postcards. 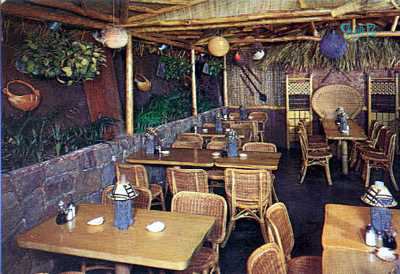 This was the bar before the renovation in 1970 that created the much expanded Molokai Bar. I am told it was really an incredible room and this single image does it no justice. There was an animated diorama that I am told was incredible. This space is now the back of the dining room. 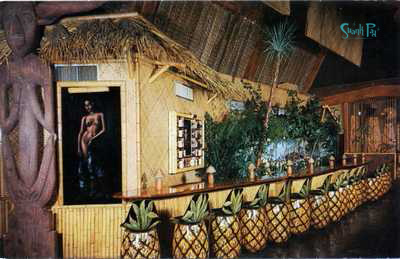 The Mai-Kai was way too popular for such a small bar! I assume this is an early card just because it is linen. Linen postcards went out of style a long time ago in favor of chrome. I think this is likely where the garden area is now. This is perhaps the oldest card. 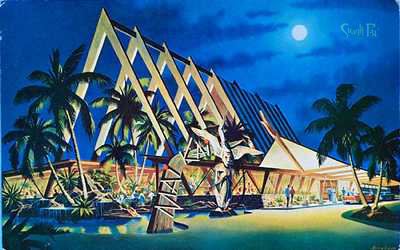 It seems to be an architectural drawing of the Mai-Kai, done perhaps before they opened in 1956 by architect Charles McKirahan. The famous iconic Mystery Drink Lady. 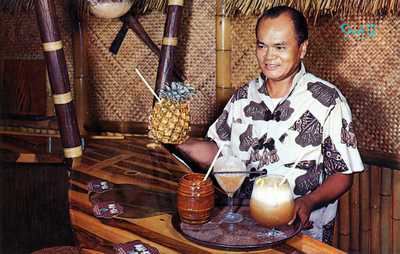 This piece of Polynesian Pop was invented by the Mai-Kai in 1959. 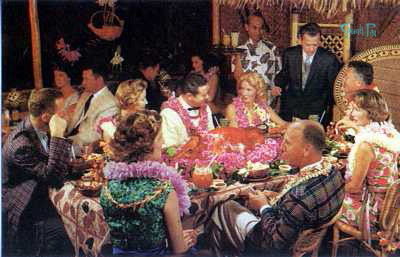 A classic luau scene at the Mai-Kai. 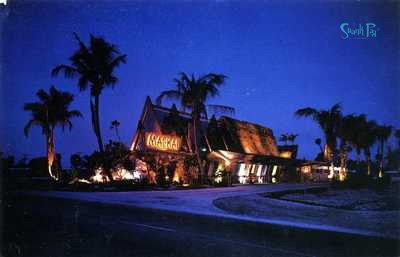 The friendly wait staff of the Mai-Kai. Middle is Ellen, to her right are Jo, Sally and Yvonne. 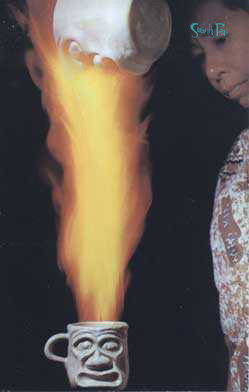 The pouring of the Flaming Coffee Grog. This is a little later than the second card above. The covered valet area is there now. 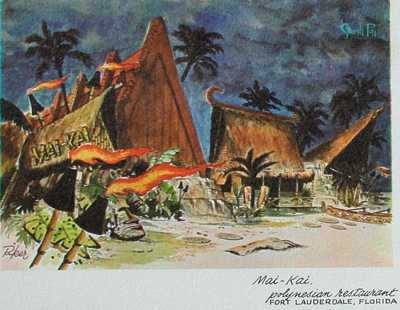 This is also perhaps a very early card from before they opened showing an architectural rendering of the Mai-Kai. 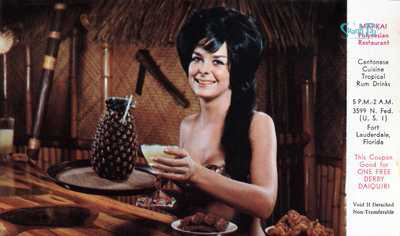 The coasters on the bar and the style of the Rum Barrel tell that this is a very early image. Likely mid-1960s. Here is his counterpart. I think this card is dated 1963. I know that's a wig, but, wow, what hair! The picture is taken in exactly the same spot as the one above. It could be the same photo shoot which would make the above image not 1950s. This is Angel. Dee's sister. 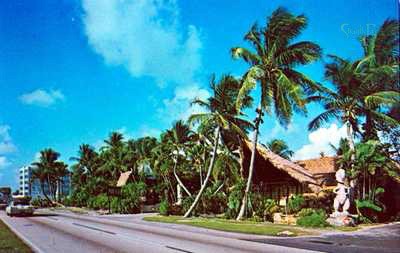 An exterior shot from the road. 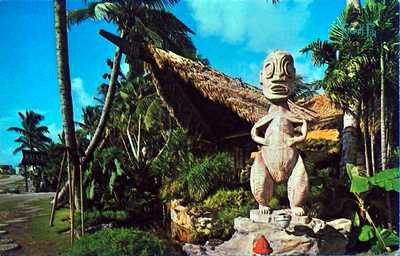 This tiki is still there in front of Bora Bora. My guess is that this is from the mid 1970s, but I am not sure. A wider shot of the with the same tiki. 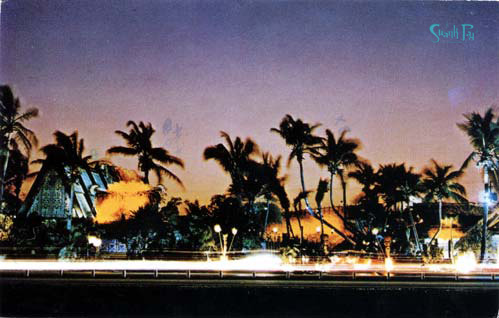 You can see the city now coming to meet the Mai-Kai. The car is early 70s. 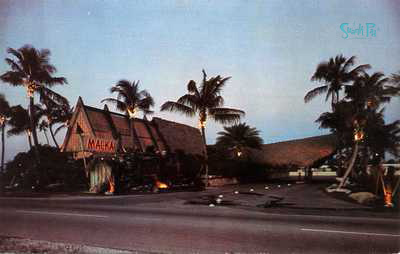 I think this is an image after the remodel that added to the Mai-Kai in the 1970s. 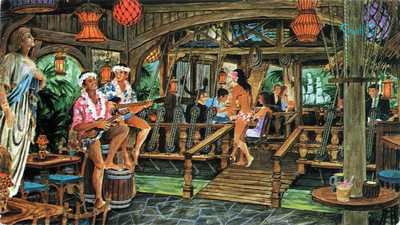 The first of a trio of paintings of the Mai-Kai that were made into postcards. This is known as the "Mai-Kai that never was". A design planned by George Nakashima and Jack Thornton featuring a 2 story addition in the gardens. 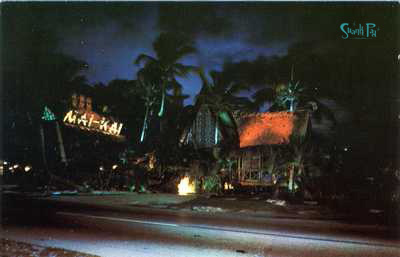 After Jack's stroke and leaving the Mai-Kai, the plans were never realized. 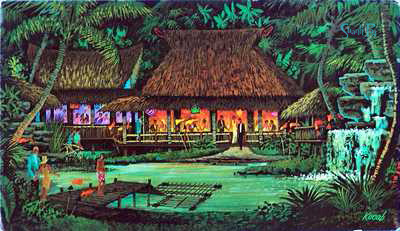 A linen card of the Molokai Lounge. Maybe this is also an architectural image of an uncompleted lounge, before it was opened. 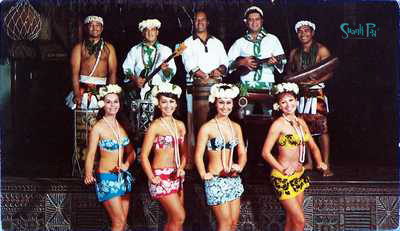 The performers of the Mai-Kai. I think this is from the 1970s as well. I think these are interior images from before the renovations. I think this is a later shot. Maybe 1970s. This shows the room that would become the gift shop after the remodel. I think it is from the early 1970s. I think it is all of them. If you have any not here, please send me images of them. 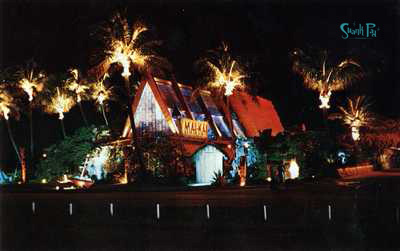 If you have not been to the Mai-Kai, you need to put it on the top of your to-do list and think about coming during my event Hukilau when it will be filled with enthusiasts from around the world. It is truly greater than any description can give.